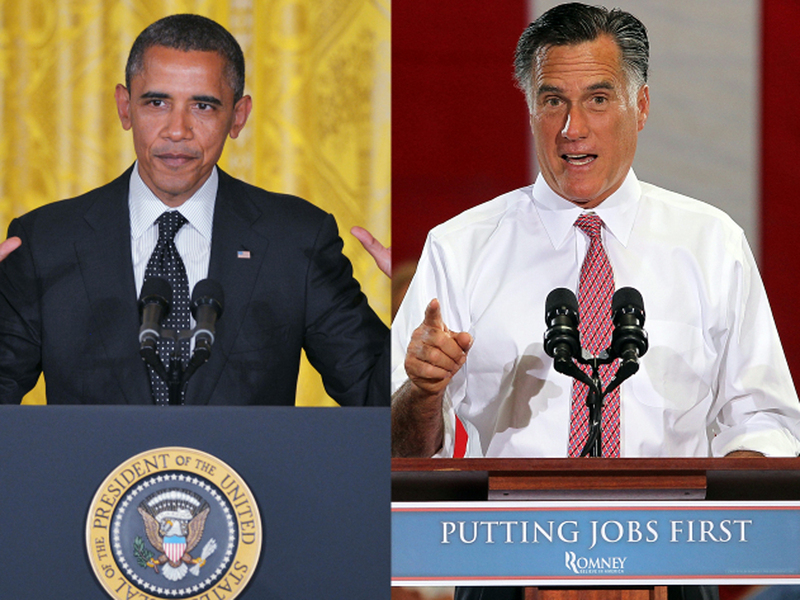 A war of words over the economy between Mitt Romney and President Obama began when the president said "the private sector is doing fine." (CBS News) President Obama and presumptive Republican nominee Mitt Romney are continuing to try to define each other on their own terms, with each side pushing a narrative of the other that they hope voters will understand and internalize. On Monday, Romney continued to hit Mr. Obama for telling reporters Friday that "the private sector is doing fine," unveiling yet another web video to keep the controversy going. The one-minute web video hits the president with television news clips from June 1, the day the Labor Department reported just 69,000 jobs were added in May. The Bureau of Labor Statistics report said the economy added 82,000 private sector jobs and lost 13,000 public sector jobs for net job creation of just 69,000 new jobs. Economists say the economy needs to add somewhere between 100,000 and 150,000 jobs per month to keep up with population growth. In addition to the lackluster May report, the department revised its estimate for job growth in March and April downward, leaving the average job growth for those three months at just 96,000. Romney's new web ad, titled "Jolt," shows CNBC reporter Hampton Pearson moments after the figures were released, saying "but overall here, nowhere to really hide, given this report." With ominous tones as a backdrop, the ad then cuts to the president's Friday news conference, where he said the line about the private sector doing fine, and that weakness in the economy persists in state and local government hiring. "Has there ever been a president so out of touch with the middle class?" reads the text on the screen. The ad is reminiscent of a September 2008 spot from the Obama campaign which mocked Republican Sen. John McCain for saying "the fundamentals of our economy are strong" as the nation was in the midst of a massive financial crisis that led to the worst recession since the Great Depression. The Romney campaign is hoping to use the clip of the president in the White House briefing room to sear into voters' minds the narrative they have been pitching for months: Mr. Obama is in over his head and doesn't understand how the economy works and is therefore making it worse for millions of middle class Americans. Meanwhile, the president's campaign team is continuing to push its narrative that while Romney may talk like a businessman who knows how to create jobs, his record as a government executive is proof to the contrary. A new Obama web video unveiled on Monday opens with a clip of Romney hitting Mr. Obama on his comment that a key source of the economy's weakness stems from local governments, which have taken thousands of firefighters, policemen and teachers from the payrolls. "He says we need more firemen. More policemen. More teachers. Did he not get the message of Wisconsin? The American people did. It's time for us to cut back on government and help the American people," Romney is shown telling the crowd as the screen shows text saying that is what he did as governor of Massachusetts. The text says "it didn't work then and it won't work now," before showing clips of local government officials from Massachusetts criticizing their former governor. "The man did not care. He didn't care what was going on in our communities," said John Barrett, a Democrat who was mayor of North Adams, Massachusetts, for more than 25 years, including the time Romney was governor. The ad then cites the Bureau of Labor Statistics report placing Massachusetts at 47 out of 50 states in terms of job growth during Romney's tenure. "Romney economics doesn't work. It didn't work in Massachusetts and it is not going to work in Washington," says Barrett, now out of office.